ICYMI, Hollywood Undead released the music video for their new single Gotta Let Go. The offering showcases a raw, authentic performance from the quintet and follows the main character during the final moments of his life, including a surreal encounter in outer space where he learns to finally let go of the past. 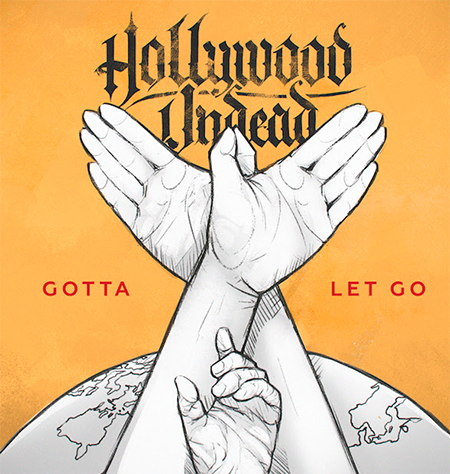 Gotta Let Go marks a shift in Hollywood Undead’s sound, highlighting a more melodic and upbeat side of the band. The track is available to stream and purchase HERE. More new music is also on the way – “Gotta Let Go” is the first of a batch of new songs to be released over the coming months. 2018 has been a massive year for Hollywood Undead. The band recently clocked 1.1 billion total U.S. streams across their catalog, as well as garnering 1.7 million total Shazams, 57 million total global streams of their latest album, FIVE, and 30 million views on all six music videos from the record. Their music has also landed on a number of impressive playlists: Spotify’s ‘New Music Friday and ‘New Noise,’ and Apple Music’s ‘The A List Rock.’ The five-piece have also accumulated 5.5 million total Pandora artist station adds and 2.7 million total Pandora radio spins on their latest album. After wrapping their headline tour across Europe, Hollywood Undead will head back to North America for a short run of dates across the northeastern U.S. and Canada. The band will play headliners in Hampton Beach, NH and Poughkeepsie, NY, followed by slots at Bangor, ME’s Impact Music Festival and Montréal, QC’s Heavy Festival. The guys will also perform at the legendary Reading & Leeds Festivals in August.